The following piece was published 6 November 2013, SBS World News Australia Radio. 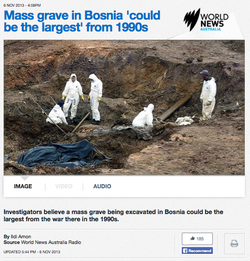 Investigators believe a mass grave being excavated in Bosnia could be the largest from the war there in the 1990s. A group dedicated to finding the bodies of those who've disappeared during armed conflict says a mass grave it's excavating in Bosnia could be the largest from the war there in the 1990s. The International Commission on Missing Persons says there could be up to 600 people buried at the site. The Commission's Adam Boys says almost 250 complete bodies and 110 body parts have already been removed from a primary grave at the site, near the village of Tomasica. The remains discovered so far are yet to be accurately identified. Mr Boys says the grave forms part of the criminal prosecution against Ratko Mladic, the general in charge of the Bosnian-Serb army during the conflict. He told Ildi Amon, it is extremely difficult work for those doing the excavations, because the remains are very well-preserved. As the Commonwealth summit draws to a close in Colombo SBS Chief Political Correspondent, Karen Middleton, explains Australia's new asylum seeker deal with Sri Lanka. As the Commonwealth Heads of Government Meeting wraps up in Colombo, Prime Minister Tony Abbott has announced a new asylum seeker deal with Sri Lanka. The talks have been surrounded by controversy with allegations of war crimes but leaders are expected to put on a united front at the summit's close with joint statements expected on issues of economic growth and funding programs to assist small countries affected by climate change. SBS Chief Political Correspondent Karen Middleton is in Colombo and spoke to Ildi Amon. The following piece was published 4 November 2013, SBS World News Australia Radio. A Tasmanian Greenpeace activist says he's being held in freezing, inhumane conditions in the Russian city of Murmansk. A Tasmanian Greenpeace activist has described the conditions of his detention in the Russian city of Murmansk as unacceptable. 59 year old Colin Russell is one of 28 Greenpeace activists and two journalists being detained on piracy and hooliganism charges since September. The group were detained after several Greenpeace activists tried to scale Russia's Gazprom oil platform in protest over oil exploration in the Arctic Ocean. In private letters released by the family and Greenpeace, Mr Russell describes freezing, inhumane conditions. But Greenpeace spokesman Ben Pearson told Ildi Amon the group is trying to remain in good spirits. The following piece was published 19 November 2013, SBS World News Australia Radio. The Northern Territory branch of the Australian Medical Association says the federal Immigration Minister's actions equate to child abuse. It says Scott Morrison should be reported to the Department of Child Protection for his decision to keep asylum seeker children in detention. The Territory's AMA president, Paul Bauert, says it has repeatedly raised its concerns with the government, but it believes the number of children in detention has probably grown in recent years. Dr Bauert told Ildi Amon it's the Immigration Minister who is ultimately responsible for the welfare of these children. 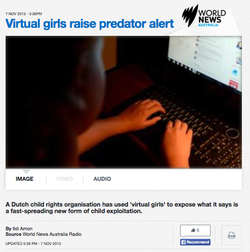 A Dutch child rights organisation has used 'virtual girls' to expose what it says is a fast-spreading new form of child exploitation. Terre des Hommes says its researchers operated avatars of ten-year-old Filipino girls in public chat rooms, and gathered details of the adults who interacted with the virtual child. The group says it identified 20-thousand people from around the world who were willing to pay children to perform sexual acts in front of a webcam. Hans Guyt, from Terre des Hommes, says 46 Australians were among roughly 1,000 people whose details it passed on to Interpol. Mr Guyt told Ildi Amon the number of people seeking to engage with the virtual girl was overwhelming. The following piece was published 18 November 2013, SBS World News Australia Radio. Emergency assistance is now starting to flow through to some of the most remote parts of the Philippines hit by Typhoon Haiyan. International aid agencies say emergency assistance is now starting to flow through to some of the most remote parts of the Philippines this month. The Catholic agency, Caritas Australia, says it's working with five other Australian aid groups and alongside the Australian government to provide a co-ordinated response. International programs manager with Caritas, Jamie Davies, is in the Philippines. She told Ildi Amon local ports, airports and roads are now accessible, so aid can finally reach affected areas. The following piece was published 10 October 2013, SBS World News Australia Radio. 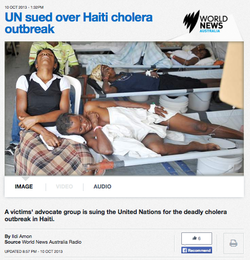 A victims' advocate group is suing the United Nations for the deadly cholera outbreak in Haiti. The non-profit group, Institute for Justice & Democracy in Haiti, says the UN should take responsibility for the outbreak. The institute wants an apology and compensation for victims' families and for the UN to provide a clean water and sanitation system. The group's Brian Concannon says official Haitian ministry figures show 8000 people died and 700,000 were injured as a result of the outbreak. However, he claims the unofficial toll could be much higher, as many victims didn't make it to treatment centres. Mr Concannon told Ildi Amon, he believes the UN does not have diplomatic immunity as it claims. The following piece was published 14 October 2013, SBS World News Australia Radio. The Bureau of Meteorology says its research indicates Australia will suffer from intensified El Nino conditions because of climate change. El Nino events are typically associated with drier conditions across much of the country, which are expected to become more extreme because of global warming. Senior researcher with the Bureau, Doctor Scott Power told Ildi Amon weather patterns in the tropical Pacific affect the weather in other parts of the world, including Australia. The following piece was published 4 September 2013, SBS World News Australia Radio. Oxfam says the Syrian refugee situation in neighbouring countries is increasingly desperate. The United Nations says more than 2 million people have now fled Syria, and an international aid agency says the refugee situation in neighbouring countries is increasingly desperate. Oxfam says Syrian refugees in Lebanon and Jordan are struggling to survive and it's calling on world leaders to urgently find a political solution to the crisis. Spokeswoman for Oxfam Claire Seaward is in Jordan and described the situation to Ildi Amon. The following piece was published 16 August 2013, SBS World News Australia Radio. 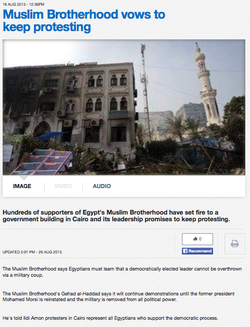 Hundreds of supporters of Egypt's Muslim Brotherhood have set fire to a government building in Cairo and its leadership promises to keep protesting. The Muslim Brotherhood says Egyptians must learn that a democratically elected leader cannot be overthrown via a military coup. The Muslim Brotherhood's Gehad al-Haddad says it will continue demonstrations until the former president Mohamed Morsi is reinstated and the military is removed from all political power. He's told Ildi Amon protesters in Cairo represent all Egyptians who support the democratic process.